Recent reports concerning the Littoral Combat Ship program grab the attention of our Naval Diplomat. Naval commentators are atwitter over a classified memorandum submitted by Vice Admiral Tom Copeman, the commander of U.S. Navy surface forces, to the naval establishment late last year. Among other things, Admiral Copeland reportedly proposed canceling the next variant of the workhorse Arleigh Burke-class guided-missile destroyer while pressing ahead with existing Flight IIA hulls. Also included in the memo was a recommendation to reevaluate the future of the Littoral Combat Ship program once shipbuilders have delivered the 24 craft already under contract. 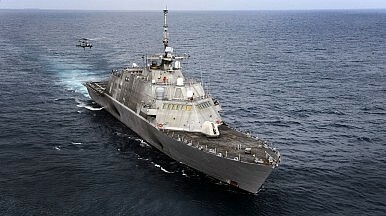 (The navy already shaved the LCS buy slightly, from 55 to 52 units.) Options under consideration include selecting a single design from what are really two separate ship classes; upgrading the ship's combat-systems suite while adding vertical launchers for antiship and surface-to-air missiles; or pursuing a different design entirely. Curtailing acquisitions would start to make the LCS look like a fleet experiment — albeit a large one, encompassing a dozen apiece of the monohull variant built by Marinette Marine and the trimarans constructed by Austal. One thing I've always admired about China's navy is its methodical approach to naval development. That comes through most clearly in Beijing's pursuit of its own DDGs. The navy built a few of several different DDGs, took them to sea to unearth their good and bad points, and incorporated their best features into future designs. Only last year did the PLA Navy settle — apparently — on the Type 052D DDG, touted as an Aegis equivalent, as its model for mass production. Given my druthers, the U.S. Navy will emulate this approach for the LCS program. It can exploit the vessels' forward deployment to Singapore, using it as an opportunity to vet the design and inform decisionmaking vis-à-vis future procurements. Alas, established sea powers no longer enjoy the same leisure for fleet experimentation. Rising powers can afford to dawdle a bit. The PLA Navy could take its time because the U.S. Navy, its major competitor, remained a reliable security provider in China's maritime environs. American dominance of the Asian seas doubtless rankled with Beijing, and it prompted the leadership to postpone its aspirations along the seaward periphery. Yet U.S. maritime supremacy granted Chinese shipbuilders and navy crews time to tinker with different ship configurations. By contrast, established navies bear responsibilities. They need numbers to fill out the inventory, and they need them now. A measure of haste thus typifies fleet development. Still, using the LCS fleet's performance to shape future plans is imperative, even as the ships execute real-world missions. Such are the burdens that befall a global sea power.